Gel permeation chromatography (GPC) can be described as a type of molecular sieving chromatography, in which a sample is separated into its constituent parts based on their molecular sizes. This is achieved by dissolving the sample in a mobile phase (solvent) and passing it through a porous column packing. The individual components travel at different speeds through the stationary phase based on their ability to enter different pores, causing the sample to separate in a process known as differential partitioning. Size-exclusion chromatography (SEC) is routinely used for chemical analysis of large molecule species (polymers) and also encompasses many biochemical applications. Gel permeation chromatography is the leading method for measuring the molecular weight distributions of complex polymers. This blog post will explore the working principles of gel permeation chromatography in more detail. To perform gel permeation chromatography, a solvent is first used to dissolve the sample of interest. The fluid is then continuously pumped into an adsorbent bed, typically comprised of porous gel beads packed into a column. Smaller sample molecules spend more time passing through the porous structure of the column and will take longer to pass through the stationary phase. Conversely, a larger sample molecule cannot traverse through comparatively small pores and will pass through the column quickly. This property is reflective of the individual molecules’ hydrodynamic volumes. It is possible to analyze an extremely wide range of molecular weights using gel permeation chromatography columns due to the development of a broad range of specially designed porous polymer packings. Conventional chromatography packings are unsuitable for detecting large molecules as they are often retained in the solid porous structure and do not elute from the column. Finely-tuned porous resins enhance the separating capability of the chromatography columns and can be tailored for enhanced resolution in a specific molecular weight range. This provides narrower separation bands for more reliable polymer molecular weight analysis. Gel permeation chromatography is now one of most widely accepted standards for determining the molecular weight of polymer macromolecules. Jordi Labs is one of the leading analytical experts in the field of polymer analysis and molecular weight determination. We operate a wide range of gel permeation chromatography systems with state-of-the-art detection capabilities and supporting almost any combination of mobile phase and stationary phase. 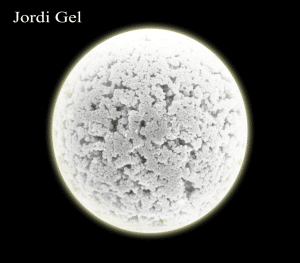 If you would like any more information about performing gel permeation chromatography with Jordi Labs, please do not hesitate to contact us.